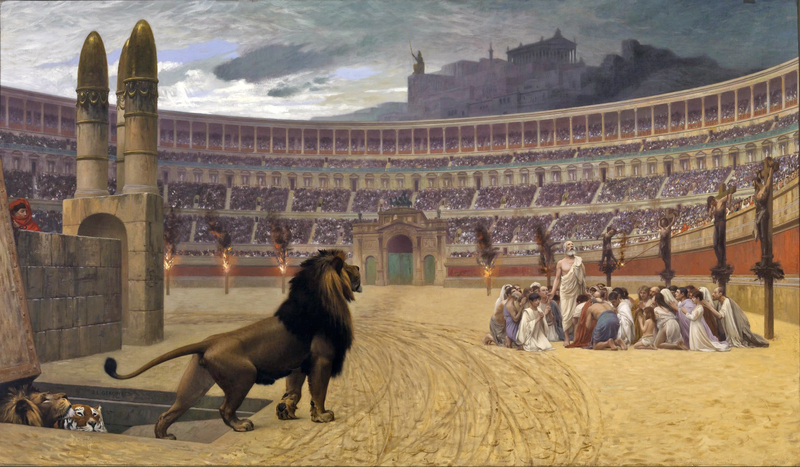 A frequent scene during the time of the pagan, Roman caesars whose personal insecurities often led to frequent, Christian persecutions, the above scene is artistically captured by the gifted French painter Jean-Léon Gérôme (1824–1904) in 1883 entitled, "The Last Prayer of the Christian Martyrs." The scene rendered on the right by French artist Leon Cogniet (1794-1880), is entitled, "Massacre of the Innocents." It was the artist's subject in 1884. Evident in the face of the terrified mother and child, this frame in history captures the unspeakable slaughter of innocent children. Under the insanely jealous decree issued by Herod I or Herod the Great (his sons Archelaus, Antipas, and Philip), the Herodian potentate murdered many innocents. In his attempt to kill the Christ child, many children succumbed to the Roman sword in Rama, a suburb of Bethlehem in Judea. Any individual, group, culture or people clamoring for external, governmentally imposed limitations on behavior or thought will soon find themselves under God’s judgment. Israel, in its quest to throw off the limitations it perceived as coming from God’s moral code of conduct, the Law, found itself clamoring for a king, just like the heathen nations surrounding her. It was during this self-imposed ‘enlightenment,’ Israel sunk to an all time spiritual and moral low point. It was during this time Israel went into captivity into a foreign land and was governed by a ruthless Gentile empire. Externally and legislatively man imposed government is not God’s idea. It may be permitted by God, however; it cannot be found within the perfect will of God. It springs from men and an insatiable desire within men for power, influence, control, and recognition. It results from laziness, indifference, and a spiritual condition known as church. It refuses to see oneself as God sees the individual—completely corrupt and destitute of the truth. Self-governance through the Holy Spirit’s indwelling, is the only solution to this failed scheme of human governance imposed upon man and others. This blight of human governance has plagued man throughout history. It had its beginning, most notably under the spiritual tyranny perfected under Nimrod. It saw its most despotic form under ruthless biblical dictators throughout history such as Nimrod, Nebuchadnezzar, Antiochus Epiphanes IV, Herod the Great, and the Roman Caesars, Nero and Caligula. In our time Pol Pot, Mao Zedong, Robert Mugabe, Adolf Hitler, Francisco Franco, Fidel Castro, Joseph Stalin, and Vladimir Lenin while all notable political figures, were ruthless and unmerciful masters nonetheless. Just as there is a self-inflicted malaise that infects all who clamor for an external, politically imposed solution to man’s ills, the biblical God has a clarion. For those who acknowledge the self-evident truths screaming from the proof evident throughout Christ’s creation, there can be only one solution—Jesus Christ and his lordship, which translates into the death and demise of self. Yes, self-government, even when patterned after Old Testament law, is vastly superior to any man imposed governmental system whose foundation rests in man’s 'hopeful' wisdom. This is in contrast to the just and equitable decrees ordained from Providence. Copyright © 2008 Day of the LORD, Paul J. Wickliffe - All Rights Reserved.